Emily is a ceramicist living and creating in Kansas City (after having recently relocated from Omaha). "Sharing stories is the way in which I share my life and my passions. It is through ceramics that these stories often find tangible form and come to life for me." Today, Emily designs and sells her work with notable stockiest such as Anthropologie and Sword & Fern. Her work is well loved by a large community of followers and customers. Emily has a beautiful eye for curation and has recently opened a shop that shares her favorites. Emily started working with clay in 2008 at Kansas State University and with the help of some incredible professors, instructors and mentors there, knew right away that she wanted to be working with clay as a professional career. Emily shares that one particular professor, Yoshi Ikeda, saw something buried in her work and that it was with his mentoring—and his personal wheel and kiln that were gifted when he retired—that fueled her growth. After graduating in 2010, Emily began creating and selling her work from her home studio, started a blog called The Object Enthusiast, and loved most the feeling of sending work out into the world. Emily did whatever she could to keep making and talking about pottery, and quickly found business growing. By 2012 Emily had quit her job and was working full time making and selling her work. "Taking the leap into a career as a ceramic artist, I will always be a student at heart. Learning from those past lessons, friendly interactions, and the world around me, I aim simply to put good work into the world. My hope is that the products of my passions and my stories can become part of your future fond memories." 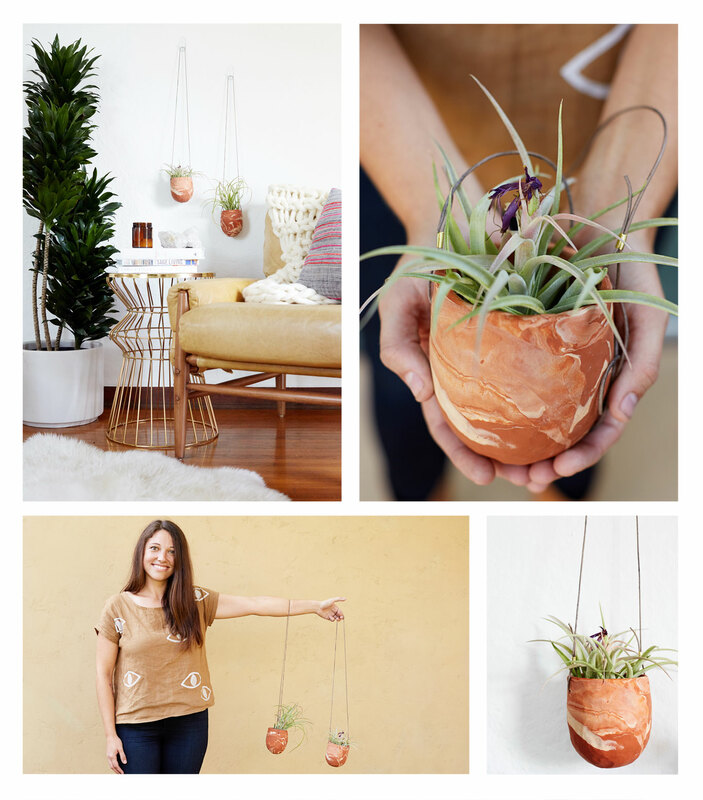 These marbled clay hanging planters introduce pottery to the novice without the need for a studio or kiln. Beautiful ceramics can be made from simple materials and with the right technique—we are pairing polymer clay, leather cording, hand folded brass clasps, and tillandsia plants for a set of statement pieces that will look beautiful hanging in a window or on display as art against the wall. Organic in color and nature, these are lovely to make and lovely to add to an art collection. They will also open up a whole new world to the endless possibilities of becoming an artist who works with clay.